Do you have a reusable water bottle? I have more than my fair share of them. Okay, I really have about six of them. I know! It is crazy! I like to have my own water bottle so that I make certain to drink all of the water I need in the day, but also so that I don't spend money on water bottles while I am out and about. I love cold water. I'm talking icy cold water! One of the draw backs to icy cold water is that condensation will inevitably form on the sides of my water bottle and leave rings on my desk or whatever table I set my water bottle on. That is annoying, but it is also annoying to put my hand on the side of my water bottle to drink and end up with a wet hand. 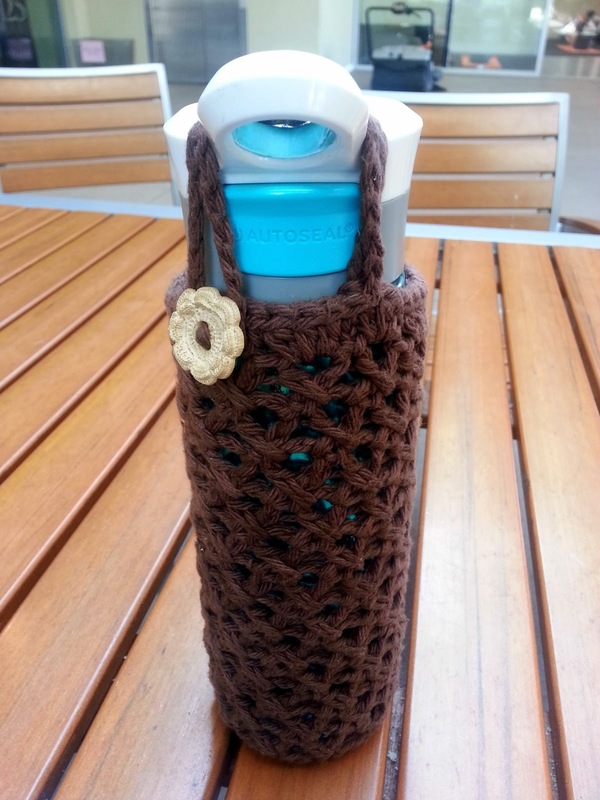 After I made my first Kindle cover, I wondered if I could make a cover for my water bottle. I've actually made quite a few, but this pattern is one that is completely different. It is not a solid cover. There are some lacy holes in it so that I can see the level of the water in the bottle. The neat part is that the cotton completely absorbs the water so that I do not leave water rings everywhere I go and when I put my hand on the bottle to drink, the cotton provides a barrier between my hand and the bottle. It's a total win-win! This pattern is completely customizable. I've designed it to work with 24 ounce bottles that have a 2 and 7/8 to 3 inch diameter base. You can easily make it larger by starting with 12 HDCs in the beginning magic circle instead of 11. The key is that you have to increase until you have a multiple of 3, so that should be the third row. *Chain 1 at beginning of each row does not count as a stitch. Row 5: Chain 5 (counts as 1 DC and 2 chains. 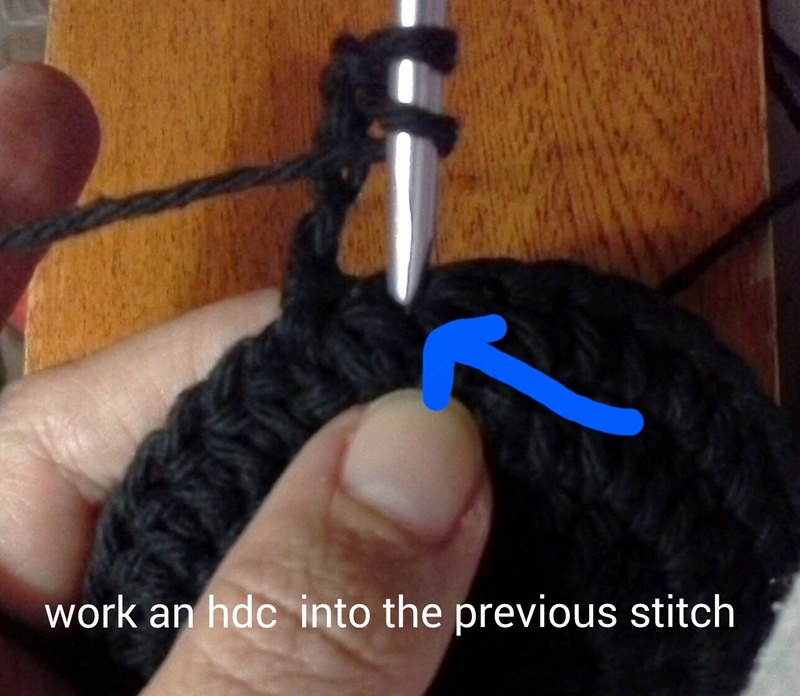 HDC in the previous stitch (1 Cross cluster created). * Skip forward past 2 empty stitches. 1 DC in the next stitch. Chain 2. HDC back into the previous skipped stitch. * Repeat from * to * around. Slip stitch into the top of the chain 2 from the first cross cluster to join. Chain 5 and work back into the previous stitch. Row 6: Chain 5 (counts as 1 DC and 2 chains). 1 HDC into the chain 2 space in the previous cross cluster (back to the right). Skip forward to the next empty chain 2 space. (This is the next chain 2 space past the one you crocheted the original DC in). 1 DC, chain 2 in that space. 1 HDC back into the chain 2 space in the previous cross cluster. Repeat from * to * around, ending with a DC into the chain 2 space from the first cluster, chain 2, 1 HDC back into the previous chain 2. Slip stitch into the top of the chain 2 from the previous cross cluster to join. Rows 6- 11 (or fewer or more depending on height of the water bottle): Repeat row 5. Row 12: Chain 1. * 2HDC in the first Chain 2 space. 3 HDC in the next Chain 2 space. * Repeat from * to * around. 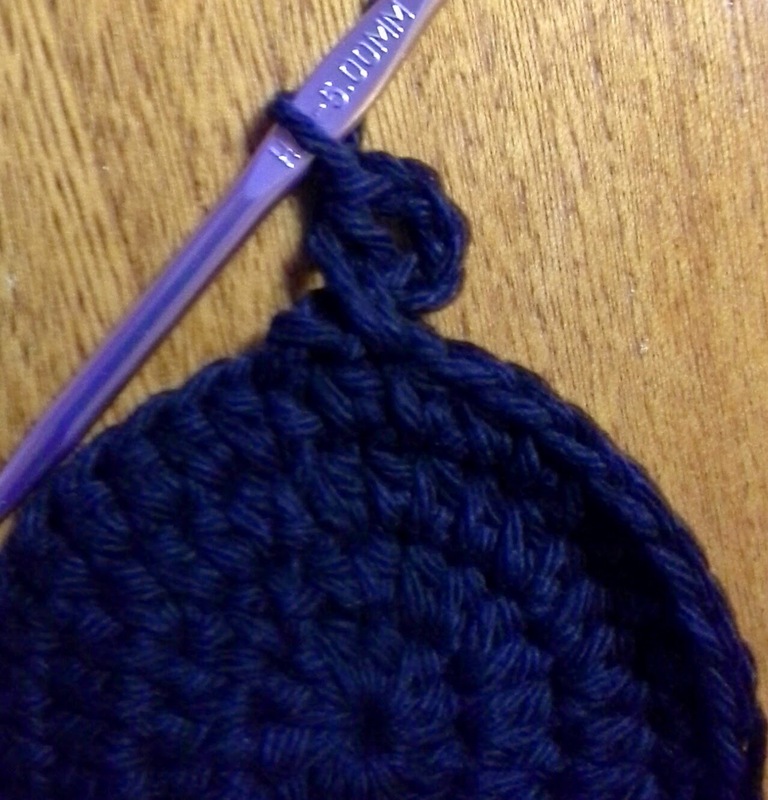 Slip stitch to the top of the first HDC. Next you will need to put your cover onto your water bottle to determine how long of a chain you will need to cover the handle, loop or other part to secure it. Chain whatever number you need to stretch the band over the handle and reach down to the middle of one of the HDCs. Count the number of chains you have made and repeat that same number. You should have double the number of chains than are needed to stretch over the handle to the HDCs. Remove the cover from your bottle. 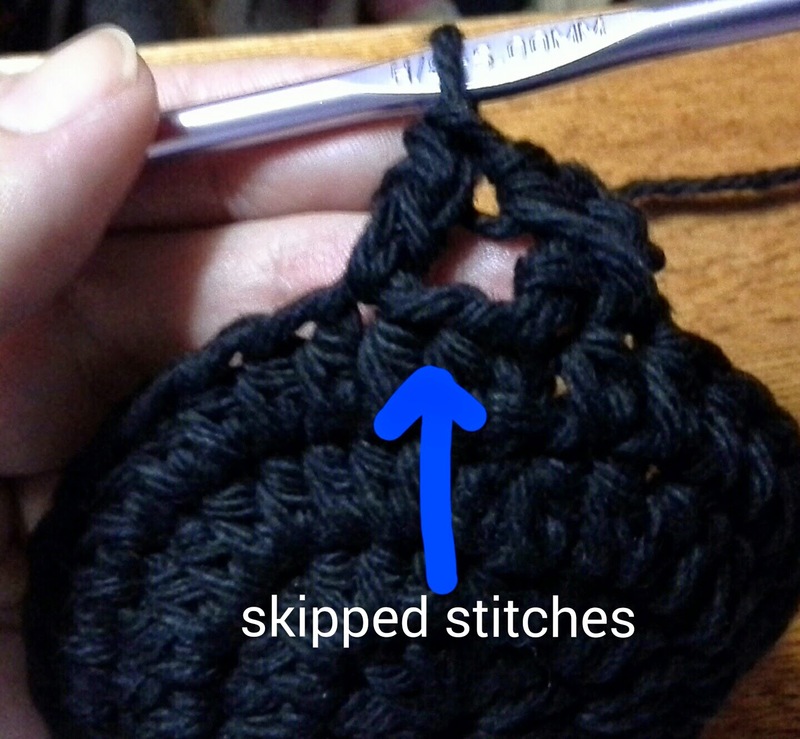 Slip stitch the end of your chain into the same stitch you started from. Row 13: Slip stitch in the top of each HDC around. Fasten off when you reach the chain loop. Weave in all ends. Put the cover back on your bottle and measure where the loop will fall in the row of HDCs to determine where the button should go. Remove the cover and sew the button on. 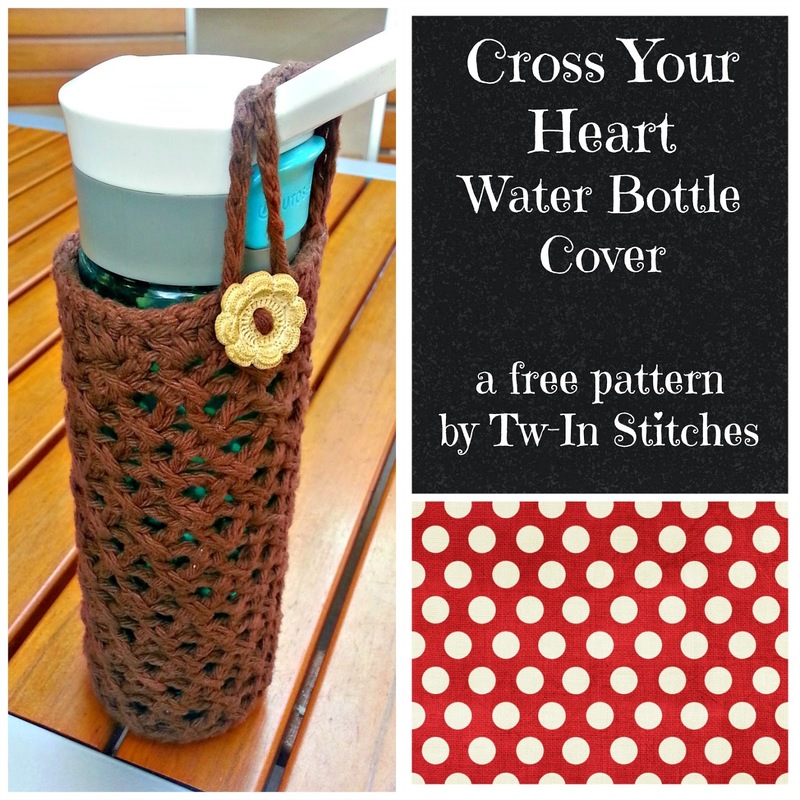 Click here to visit the Cross Your Heart Water Bottle Cover on Ravelry. If you like it, please add it to your Ravelry cue or add it to your favorites. Thanks, Lee Ann! I'm glad you enjoyed it!